When I was growing up in the Philippines, I would occasionally feign illness to miss a school day. My mother would then send our househelp to buy and bring back every type of food I could think of and one of my favorite requests was arroz caldo from the downtown wet market. Before she would leave for work, my mother would leave detailed instructions to our yaya on what times I will be taking my paracetemol and on when to warm up the arroz caldo for me. My mother has always been good that way, always bent on making her children happy. Did she know I was faking sickness? Of course. Arroz caldo is the Filipino’s interpretation of congee. 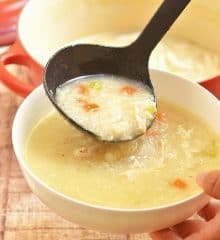 In this rice soup, chicken pieces (preferably bone-in) and rice are boiled in a ginger-based broth until the grains have disintegrated into porridge-like consistency. Fried garlic bits, chopped green onions and calamansi juice are added for additional layers of flavor. The gruel is more common as a midday merienda but as it often includes meat, eggs or seafood, it is substantial enough to serve as a meal on its own. Although I usually start arroz caldo with uncooked rice, you can substitute leftover steamed rice to cut through cook time. Enjoy and keep warm, my friends. Trim chicken of unwanted fat, rinse and drain well. In a pot over medium heat, heat oil. Add onions, ginger and garlic. Cook, stirring regularly, until limp and aromatic. Add chicken and cook, stirring constantly, until lightly browned and have rendered juices. Add fish sauce and continue to cook for around 1 to 2 minutes. Add rice and cook, stirring regularly, until rice starts to lightly brown. Add water and bring to a boil, skimming scum that floats to surface. Add bouillon cubes and stir to dissolve. Lower heat, cover and simmer, stirring occasionally, until the rice has softened and the congee has thickened to desired consistency. Season with salt and pepper to taste. Ladle on bowls. Add boiled egg and garnish with green onions and toasted garlic. Serve hot with calamansi and additional fish sauce on the side. In a small pan over low heat, heat oil. Add garlic and cook until golden and crisp. With a slotted spoon, remove toasted garlic and drain on paper towels. Your recipes are amazing. I was wondering if it’s possible to modify them with instructions on using an instant pot to cook them in….For example, the arroz caldo….in a pot, we use uncooked rice….whereas, I’ve seen some videos where when an instant pot is used…the ingredients call for cooked rice. Thank you so much, April. I am glad you’re finding the recipes helpful. Yes, I will be converting a few recipes to Instant Pot. I’m a big fan of this appliance; it’s a true time saver! Thanks a lot for your recipe. It was my first time to cook it and your instructions were very clear…. it sure made me feel like an “expert ” because my friends liked it. Hello Lalaine! Thank you so much for sharing your tried-and-tested Pinoy recipes. I’ve been visiting your site whenever I want to sumptuous meals for our family. Can you use chicken broth instead of the cube? If so, I’m assuming you omit the water? Thanks! I always use kawaling pinoy in all of my recipes! Delicious! First time I made arroz caldo. My son loves it! I never knew about the fried garlic bits and hard boiled eggs. Thanks so much for the recipe! Do you use jasmine or calrose rice? I’m going to cook this tomorrow & I’m at the edge to which rice is best to cook arroz caldo with. Thank you! Like my granma use to make. Thums up! I made for my Thai wife and she love it! Thanks for the recipe. I’ve never actually cooked this delish of dish—there’s always someone else who cooks it for me. Now that I live alone and been wanting to have it, it’s actually quite easy to make than I thought it would be. Yes, arroz caldo is one of the simplest things you can make. Yet so comforting and satisfying. BTW, loved the arroz caldo photo on your blog. Looks so good and inviting. Hey, thanks for the recipe. I made this for my mom, who was sick. It turned out great, even without some of the garnishes. I will say this: MUST SERVE WITH LEMON. It felt so good to drink the hot lemony patis-sy flavor. 🙂 My filipina wife even gave me thumbs up! I agree, lemon (or calamnsi juice) is a must for arroz caldo. I am glad your arroz caldo was a success and enjoyed by the family. My best wishes to your mom, hope she feels better soon. Happy holidays. So glad I found this recipe. I definitely need to make this soon. It’s so cold outside!